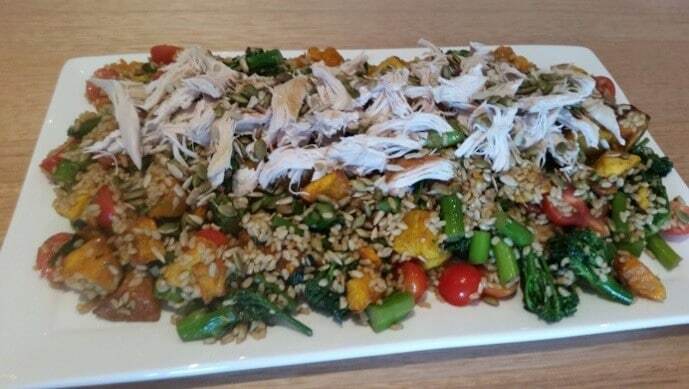 This is one of our Dietitian Nicole’s favourite recipes for her family. This meal can be made well ahead of time and have it in the fridge ready to eat when you get home. Stir fry some broccolini with water and a little oyster sauce until tender. Mix with cooked brown rice, roasted pumpkin, and cherry tomatoes. Dress with a little olive oil and soy sauce or Ketjap Manis. Cool in fridge and top with toasted sunflower seeds and pepitas and a lean protein of your choice. As a protein, it works well with shredded BBQ chicken, sliced steak, fish, poached eggs and even a tin of tuna. To save time you can use microwaved brown rice.